Heal, awaken and reconnect to your source. Step into and embody your power fully. Let go of all thats no longer serving your mind, body and spirit, while building a freedom based conscious business and lifestyle. Learn to lead from your heart, live on purpose, and serve others. This small group, hands-on, personalized program is designed for the passionate yogi who is eager to learn in-depth philosophy, sequencing, hands on adjustments, anatomy, and cueing. The Epic Academy includes a large section devoted to conscious business building and website design. Our mission is to help you build the most solid foundation to launch your grandest vision. The conscious business skill set required to make an abundant and sustainable living teaching what you love is not taught, or even discussed, in the vast majority of yoga teacher training programs. Most teacher training programs also cram 40 students together providing very little, if any, one on one instruction and guidance. So, what do all of these newly certified yogis do with their training? Not much, unfortunately. A love for yoga, dedicated self practice, and a 200 hr certification isn’t enough knowledge to share this information with others safely and manifest your dreams. In this ground breaking 32 day program we’ve fused our Epic Academy Business Curriculum with a 200 hr YTT certification program. In our signature academy we empower and assist you to create your personal brand, develop and share your voice, design and launch your website. Immerse in our advertising, social media marketing, blogging, copy writing and sales techniques. We’ll have a ton of fun along the way. Sculpting your vision is SO exciting and rewarding. Like you, we believe in spreading light, peace and love to the far reaches of the universe. In order to make a massive positive impact, by giving more and reaching more people, the light leaders of the world need to know how to run a business. Personal growth and business development go hand in hand. As you awaken and step into your power, your business will bloom. Are you eager to transform & launch your dream business? Submit your details and we’ll email you shortly. Explore a vast array of asana styles and theoretical elements using Hatha as the foundation. Morning practice is an intensive two hour Vinyasa flow. While the afternoon is a gentle two hour Hatha with deep focus on alignment, pranayama and meditation. Remaining time will be spent on lectures covering topics of the day. 100 hrs total. Learn all aspects of teaching including: how to plan classes, choreograph sequences, demonstrate postures, execute physical adjustments, use voice and verbal cues (English and Sanskrit). Practice and learn how to hold space for a variety of different emotions, physical injuries and limitations. Using props and modifying postures is also extensively covered. The importance of observation is emphasized and the foundation of excellent teaching. 25 hrs total. Dive deep into the physical (muscles, bones, fascia etc.) and energetic (chakras, nadis etc.) anatomy of the human form. Aly teaches all body systems (eg. nervous system, muscular system, endocrine, etc. ), human kinetics and how all of these relate to yoga practice. Anatomy provides a comprehensive blueprint for all postures while clarifying the effects of pranayama and meditation within the body. 20 hrs total. Review topics within Hindu mythology and the traditional teachings from the ancient scriptures of The Yoga Sutras, Hatha Yoga Pradipika and The Bhagavad Gita. Looking into these Vedic scriptures gives you insight into how much more there is to your yoga practice than the physical body. By learning the 8 limb path and applying it throughout your life you will be more confident incorporating it into your classes without overwhelming your students. Two hours are spent on the ethics of the teacher-student relationship and how important this is when giving physical adjustments. 30 hrs total. Practice teaching to the group. Develop your voice and style. Sometimes the scariest part of being a new teacher is getting up in front of people. The more you practice within a supportive group the more your confidence grows. This is a chance to receive and give feedback as well as observe others teach. Electives are interspersed throughout the month and include kids, Ashtanga and pre-natal yoga practices. Basic Ayurvedic principles and variations for advanced postures are also covered. 10 hrs total. 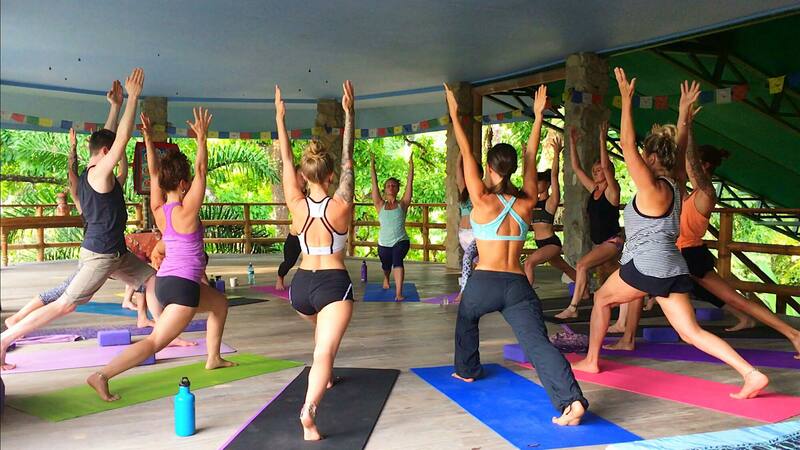 Do you want to teach yoga classes, workshops and retreats all over the world? Are you eager to offer online yoga programs and create a video series you can sell? Or perhaps you’d like to open your own studio and build a large private client base? What ever your dream includes will require a website and key business techniques. Our 32 Hr academy preps you with all of the marketing and sales techniques necessary to launch a thriving business on the ground and online. Learn how to design and build your own website on the robust and renowned WordPress platform to showcase your talent and mission to attract students. No coding required. It’s incredibly important that you know how to function your own website without the need of a developer or designer. Having complete control over your website is critical to saving money and expanding your brand rapidly. Below is the short list of what you’ll know how to do by the end the month working one on one and in small groups with Amber and Daniel. Create your brand name and logo. Buy your domain and hosting service then active WordPress. Upload a theme, create the design, write and complete all copy. Use marketing and sales design to direct your site traffic. Optimize your site for search engine ranking. Write blogs strategically to increase site traffic. Create and price your services. Set up your social media accounts: Facebook and Instagram. Short and long term marketing strategy for social media and beyond. Humanize and normalize the sales process removing the fear that often comes with it. Start to finish sales strategy that is specific for your unique business. Honesty and efficiently promote your product and services. Navigate and optimize the relationship between marketing and sales. Understand your business pipeline from concept to completion. Gain clarity on the content and quality of your services and pricing. Close sales like a JEDI. “Being a part of the Epic Academy YTT program was an experience of a lifetime!! 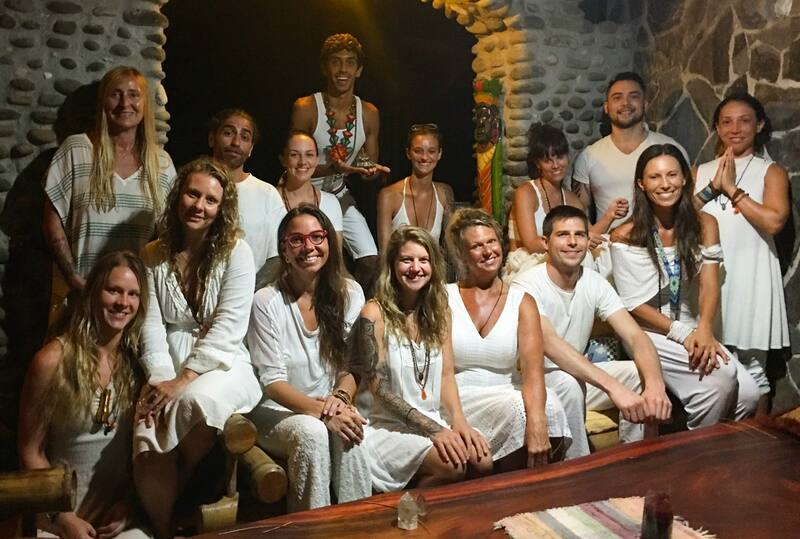 From the yoga training, to the amazing meals, to the love and devotion that Amber and the facilitators gave to me and all the participants, there wouldn’t be anything I would change from my experience. From the time I made the commitment months ahead, all the way to the end of the training, all my questions were answered and I felt completely supported throughout my challenges and growth periods. “Aly Nind organized and facilitated such an amazing teacher training program. Not only was she committed to delivering a well-balanced curriculum, she was also able to find that same balance with her students. We each came with very different experiences, information and knowledge bases. Aly was able to understand us, challenge us and support us, in the areas that we were wanting and needing. She took the time to link the theoretical with the practical; she supported us in our philosophical and theoretical lessons; she helped develop our personal practices and move us beyond our comfort zones. An international Vinyasa and Sattva yoga instructor, former professional break dancer, and the owner of The Yoga Home in Alberta, Canada. Over the last 10 years she has taught many forms of yoga and dance around the globe. Aly discovered the healing and transformative power of yoga after suffering many injuries in her dance career and other favorite activities like surfing and snowboarding. 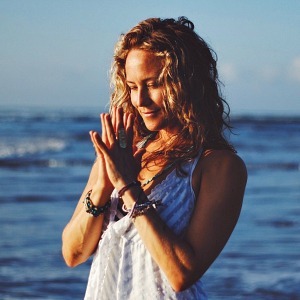 Aly is a certified and registered Yoga Alliance Teacher with over 900Hrs in Hatha, Ashtanga, and Sattva yoga. Plus, another 2200 hrs in Massage Therapy. She specializes in Therapeutic and Cranio-sacral massage and adores weaving these healing modalities into her yoga classes, workshops and retreats. Over the last several years she has lead annual retreats in Costa Rica and Peru. 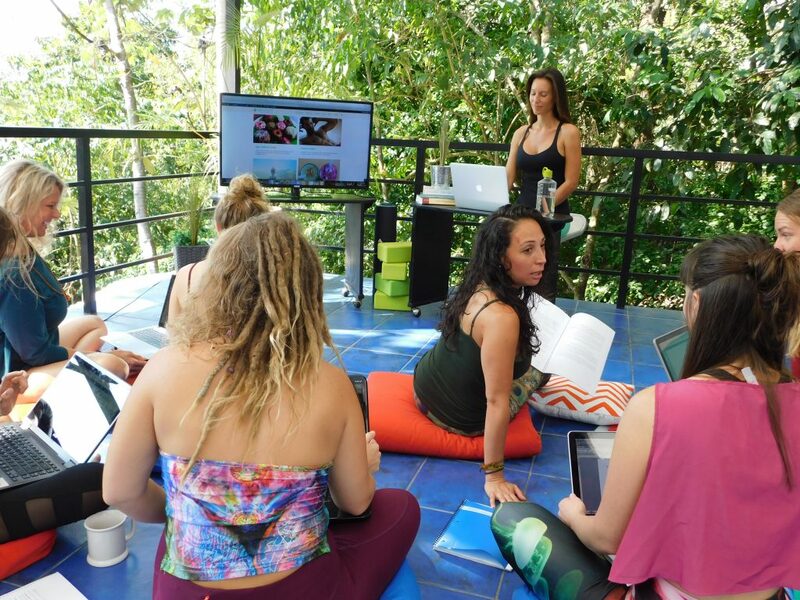 Aly’s passion for sharing the transformative power of yoga lead her to create her own teacher training program. She is the lead educator for the YTT portion of this program Mon-Friday. The founder of EpicSelf.com, international pilates and yoga instructor, former professional dancer, and holistic nutritionist. She holds comprehensive certifications in Vinyasa Yoga, SUP Yoga, The Pilates Method (mat and apparatus), and Holistic Nutrition. Over the last decade Amber has taught her passions around the globe at several of the top retreat centers and festivals, while maintaining an online private client base. She adores nothing more than sharing the healing power of movement. She is a self taught web developer, former professional blogger, and social media maven who is passionate about empowering entrepreneurs to build their dream businesses online. 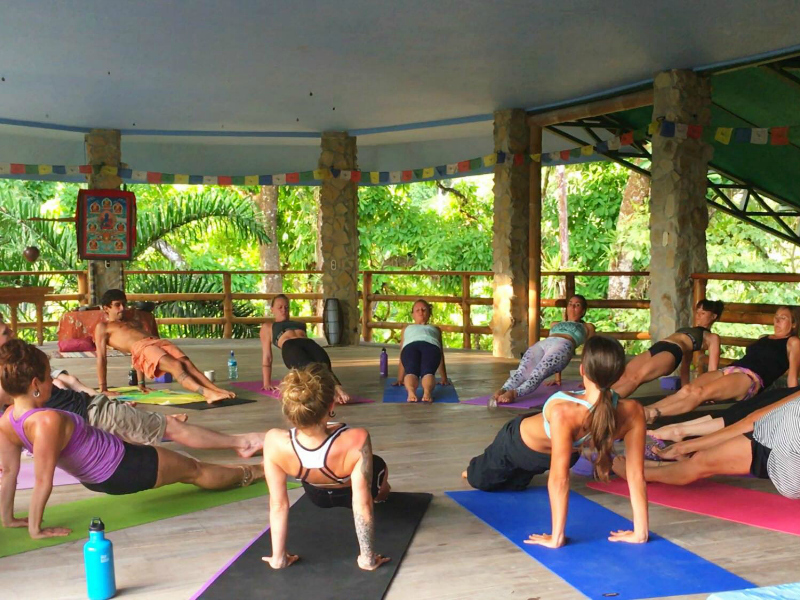 She produces all inclusive week long retreats and The Epic Academy program every month in her home base of Manuel Antonio. Amber teaches the Pilates Mat and Myofascial Release Workshops, the SUP Yoga/Pilates Intensive, as well as half of the business training along side Daniel on Saturdays. Author of the #1 Amazon bestselling book “Live Vibrantly! 10 Steps to Maintain Youthfulness, Increase Energy and Restore Your Health” is fiercely committed to guiding people in taking ownership of their health giving them freedom to live life beyond the ordinary; full of energy, free from fear of aging or disease. Her path to becoming a Restorative Eco Chef and Wellness Coach became clear after having restored her own health from one debilating health issue after another including an auto-immune disease. Over the last 28 years she has become a wealth of knowledge in this area and focuses on the importance of culturing and sprouting along with food combining to support you to be your most vibrant self. As a vibrant living soul, she is passionate about teaching and sharing this knowledge with others so they too might live as their most highest self. Johanna is our head chef and holistic nutritionist. She teaches two nutrition workshops during the academy as well. Mentors heart centered & spiritual entrepreneurs who want to create a purpose driven business and living brand. He is an expert at taking entrepreneurs to their greatest levels of success. He’s closed over 60 million dollars in business and has created multiple millionaires. With 20+ years of entrepreneurial experience and extensive study with people like Jack Canfield, Tony Robbins, T Harv Ecker, Bob Proctor, Lisa Nichols, Pamela Brunner, Mande White, Sean Smith and Russell Brunson he has taken the wisdom from each of his influential teachers and compiled it in one place to serve you and your business. 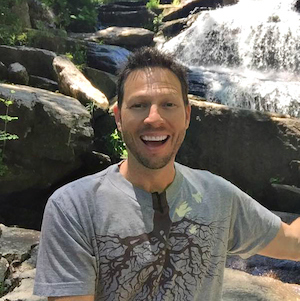 Derek will be teaching his “Authentic Yes” sales system and helping students build and implement their first automated sales “Trust Funnel.” His in-depth and empowering 2 hr workshops are every Saturday. Each student will also receive one on one coaching with Derek. Every Saturday morning enjoy in-depth 90 mins Pilates Mat and Myofascial Release workshops designed to take your personal practice and teaching to the next level. These 6 hours count as part of your total elective hours. Amber shows you how to weave these two extremely powerful techniques into your yoga offerings. Learn the 7 guiding Pilates principles and how you can easily apply them to enhance all of your favorite activities. Flow through Beginning-Advanced mat sequences with Amber and learn how to move from your center with proper alignment, ease and grace. Pilates is a rigorous and precise method created to uniformly balance and build long lean bodies. Dive into the intricacies of Myofascial release with tennis balls and foam rollers. Amber teaches you how to roll out the most tense places in your deepest connective tissue from head to toe. By releasing the fascia and blasting through energy blockages we unlock a new level of mobility. This technique and skill set is invaluable for pain management, injury prevention, increasing mobility, and improving performance on every level. Imagine a full body deep tissue massage you can give yourself and teach your students how to do for themselves. Take all of your yoga and pilates skills to the gorgeous 85 degree Pacific Ocean. In this 2.5 hour intensive you’ll flow through a dynamic pilates vinyasa fusion class on a stand up paddle board with Amber. We launch from one of the most mesmerizing peaceful coves and paddle out along side little islands for class. Learn how to stroke with the paddle properly and safely with your core for speedy and efficient traveling. Amber leads and shows you how to enter the waves and read the water currents for the safest and most fun experience. Practicing on a wiggling board adds a major stability challenge to your asana. Falling in the warm water is part of the fun and the many lessons we learn from the ocean. Take the tips and tricks you learn out on the water to apply to any of your class offerings once you graduate. 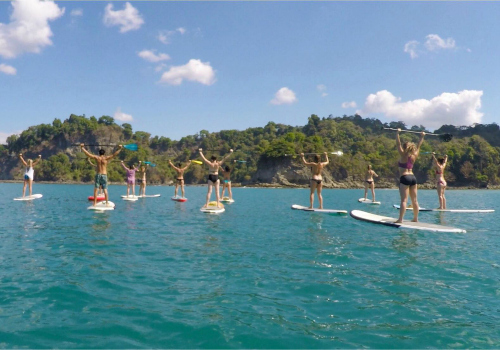 Stand up paddle board yoga is also the fastest growing trend in the yoga world. Knowing how to lead others through this fun experience is invaluable and allows you to stand out amongst the competition as a teacher. 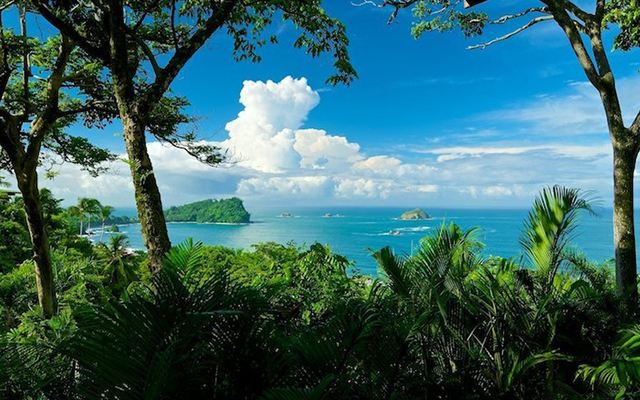 Villa Jacana is a 5000 square foot, 4 level, 7 bedroom, luxury jungle mansion nestled in the Manuel Antonio Estates neighborhood. The home has gorgeous ocean views, multiple yoga decks, an open air layout and a private pool. The Balinese inspired decor creates a zen oasis for our training. The house also has the fastest wifi available in Costa Rica for all of our website building. Maid service is twice per week and the laundry facility is open for students to use throughout the month. The Quepos Marina and waterfront is a 15 min walk from the house and buses run every ten mins to and from Manuel Antonio main beach. 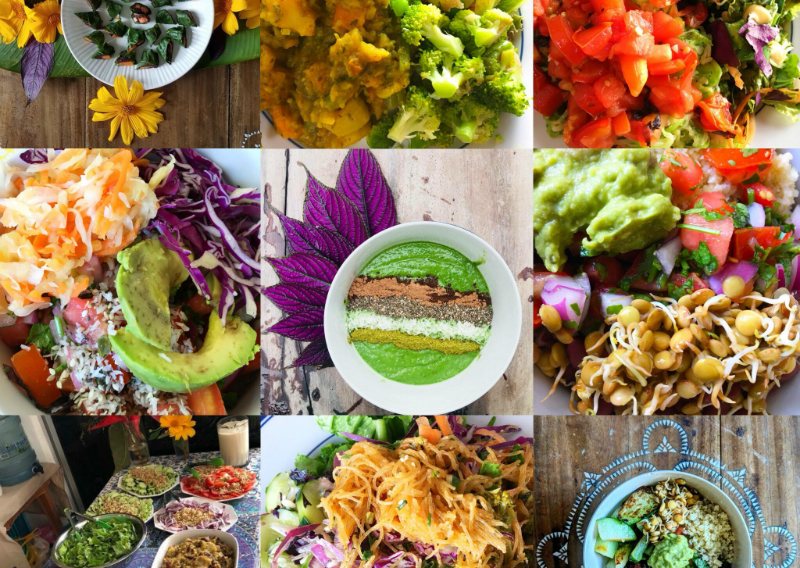 Enjoy delicious raw and vegan superfood cuisine prepared and served by Johanna Thorn. Plant based nutrition, especially during such vigorous training, is key to boosting the quality of your experience. We only use the highest quality, locally grown, certified organic produce and super foods to create scrumptious dishes. Johanna soaks and sprouts all nuts, seeds, and legumes for her dishes and specializes in fermented foods. 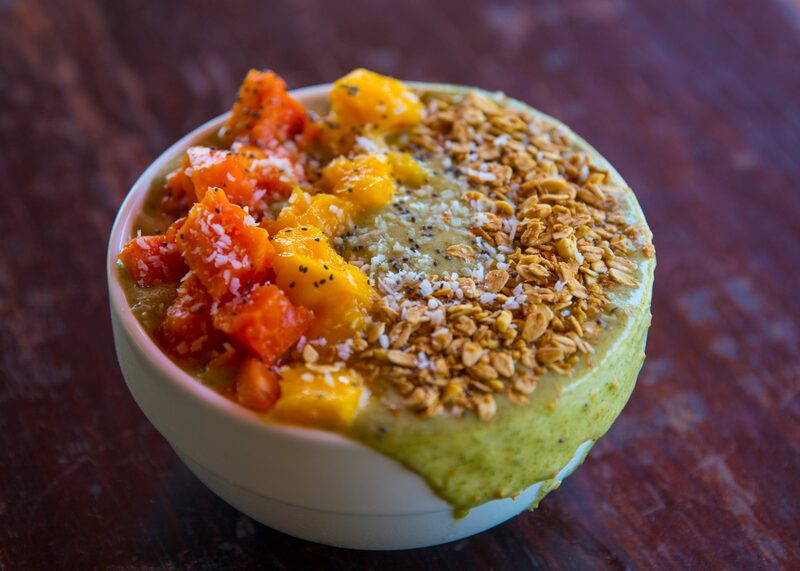 Sip on green juice, superfood smoothies, herbal teas, and savory soups. Munch rainbow salads, wraps, pasta, burgers, and pizza. All meals are crafted with proper food combining guidelines and fermented foods to aide digestion, cleanse, and boost your immunity. We offer a low glycemic and low sodium menu that is designed to heal our students from the inside out. You won’t know what to do with all of your new energy. Sacred plant medicines and temazcal sweat lodges have been used by shamans world wide for thousands of years to heal, awaken and elevate consciousness. We mediate in ceremony with the renowned mother of all master plants. This medicine comes from the depths of the Amazon rainforest and has been used extensively to elicit spiritual revelations, heal past traumas, and reverse addictive behaviors. One ceremony sipping this mystical and potent brew has been described as 10 years of meditation compressed into one night, plus the deepest physical and emotional cleanse of your life. Two ceremonies in a row allows the medicine to heal deeper. This experience sparks the beginning of a powerful spiritual journey to the center of your heart and the depths of the cosmos. We could think of no better way to enhance the celebration of your graduation from training than with a traditional Native American Crow sweat lodge and back to back plant medicine ceremonies February 17th through the morning of the 19th at Posada Natura Retreat Center. We work with the highest integrity and most experienced shaman in the region. Creating the safest space for your spiritual unfolding and evolution is our top priority. We’ve lead over a dozen groups to The Temple of Light in the last year alone with outstanding results. The guests testimonials are truly awe-inspiring. Read several of them here. Once you apply we will reach out to discuss pricing & payment plans. A “Can-Do” attitude with ability to problem solve. Now is the time to build your dreams! Submit your details and we’ll get back to you shortly. Arrivals and Departures: Manuel Antonio is 2.5 hours drive by car from San Jose. Shuttles run at 8:15am and 3pm from SJO to Manuel Antonio. Once you are accepted and registered you’ll need to book your flight to land no later then 12:30pm noon on January 13th, 2018. Once we have your flight times the epic team will book your shuttle pick up from the airport and send you confirmation via email. Ground transport to and from San Jose International is included in your package. Check-In at EpicSelf HQ begins at 11am January 14th, 2018. Check-Out is February 15th at 11am. If you’d like to purchase additional nights before and/or after your retreat please inquire with an epic team member via email. Cancellation Policy: We offer a payment plan with four non-refundable installments and opportunity to receive financing for up to six months with no interest. A non-refundable $2000 deposit is due to hold your space. All payments are non-refundable, but are transferrable to a future training if a personal or family emergency arises with proper documentation. We reserve the right to ask you to leave if you break our training house rules repeatedly and/or disrespect your fellow students and teachers. You will be give 2 strikes before you are asked to leave. No refund will be given. Students are not allowed to switch trainings based on any reason other than personal or family emergency. Not Included in Package Price: Your flight. Transport costs while staying in Manuel Antonio. The EpicSelf staff will assist you with all logistics and planning once you register. Don’t hesitate to reach out with any questions. We are happy to assist.